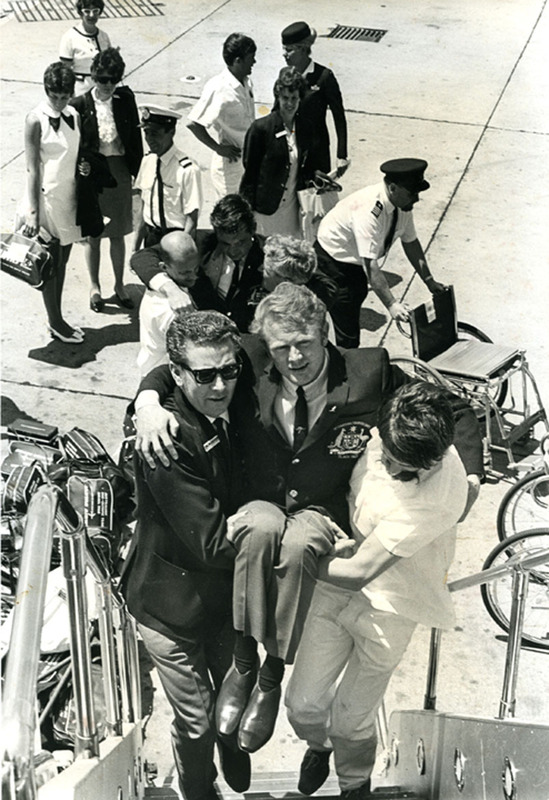 The 1968 Paralympic Games, originally scheduled for Mexico, but instead held in Tel Aviv, were marked by Middle East politics. Israel’s Six Day War against Egypt, Jordan and Syria was just over a year old, and during the Games hostilities between neighbouring countries continued. In an attempt to depoliticize the Paralympics, the Tel Aviv Games abandoned national anthems, flags at medal presentation ceremonies, and an official medal tally. For many Australian athletes, the Tel Aviv Games demonstrated the impossibility of separating sport, including disability sport, from international politics. Evoking memories of Rome, eight years earlier, accommodation for Australian athletes in Tel Aviv was inadequate. Gary Hooper and Bruno Moretti recall the Australian team’s challenging living situation. The Games in Tel Aviv also marked the retirement of three of Australia’s most successful female competitors: Elizabeth Mills (nee Edmondson) who had won five gold medals, and one silver in her Paralympic career; Lorraine Dodd who had secured five Paralympic medals; and Daphne Ceeney, Australia’s first female Paralympic gold medalist, who retired with fourteen Paralympic medals to her name. Ceeney’s feats were recognised with prominent roles in the Paralympic torch relay and the opening ceremony of the athletes’ village for the Sydney 2000 Paralympic and Olympic Games. Australia sent nearly triple the number of competitors it sent to Tokyo, with a team of thirty-two athletes and eighteen support staff. List of the members of the 1968 Australian Paralympic Team for the Tel Aviv Games, with links to the members’ Wikipedia articles. The medicos said "altitude is not for you"
"If I pay my way, can I come?" "You could hear the guns going off in the distance"
"They'll just shoot you Kevin, you don't know what they're doing"
Looking for more about the 1968 summer Paralympics? Here are some links you can visit and ideas to find out more.